Fifty years ago on this day, Bill Vollbracht founded Land Title Guarantee Company. In January 1967, it started with one person, one customer and one order. While our company has grown to over 700 employees handling more than 50,000 real estate transactions per year, the basic business principles and values are the same today as they were 50 years ago. Below is an illustration of some of the things we have accomplished, and though the statistics might seem big for a locally owned, Colorado focused company, our goal has never been to be the biggest. It is simply about being the best in everything we do - one customer and one order at a time. So today, we want to say thank you to the individuals and organizations that helped us be our best along the way. Bill Vollbracht's upbringing in his family's rural Kansas grocery store taught him that great customer service and success in business stems from doing things right and building trusted relationships - with customers, employees, friends and the community. Our customers have always stood by us and pushed us to do better. It is our customers and their expectations that encouraged us to develop new, innovative technologies; to expand our professional and technical expertise; and to maintain our focus on customer service. We know our customers place their trust and often their reputations with us. We are humbled and grateful for that. 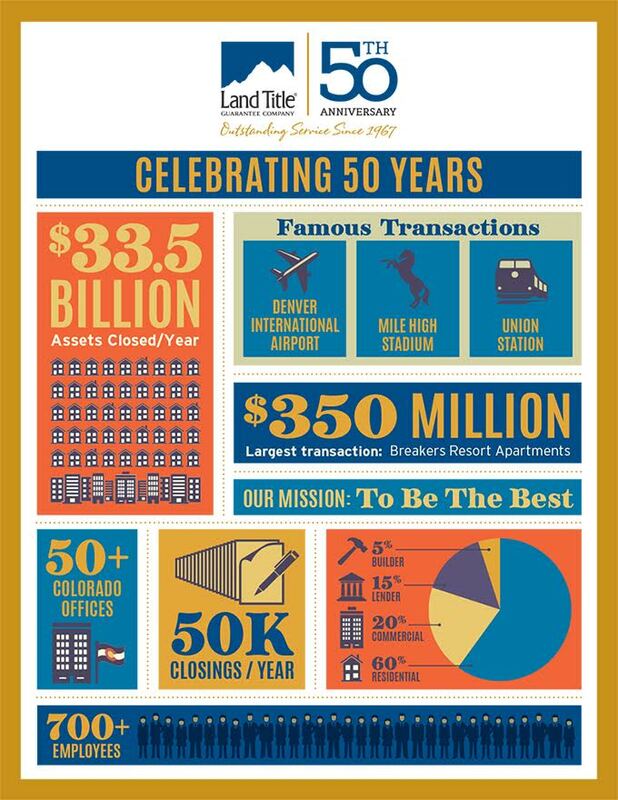 Whether a customer started working with us 50 years ago or yesterday, we sincerely value every customer that comes to Land Title. We work to earn their respect and trust every day: in the customer service we deliver, the technologies we introduce, the commitments we send out, the closings we perform, and the relationships we build. Thank you to our employees. The deep passion, innovative spirit and relentless energy of every Land Title employee has fueled our progress and will continue to propel our growth in the coming decades. Like Bill and my father before me, I could not be more humbled and honored to stand behind such an incredible team that is so dedicated to excellence in every commitment, every closing and every customer interaction. One of Bill and John's strongest tenets was that if an organization hired talented people and took good care of them, they would naturally want to remain with Land Title and would take great care of our customers. This belief in empowering and retaining talented teams continues to ring true today. In fact, the average Land Title employee has been with us over eight years. Yet the lengths our employees go for our customers, and each other, could not have been imagined. We are truly grateful for the service our employees perform, not because they must, but due to the personal relationships they value with their customers and their peers. Everyday, we are reminded of the small, arduous steps that got us here. Yet 50 years later this special day also reminds us of those customers, employees and friends that helped carry this organization. Through the contributions they made - big and small - Land Title grew into one of the most respected title insurance organizations in our state and our industry. Thank you for your contributions and trust over the first 50 years of our journey. We truly value our relationships. We simply would not be here today without you.